The Military & Flying Machines Team are so excited and pleased to be able to confirm some very special news for the 2013 show at Damyns Hall Aerodrome. Due to public demand we are expanding our show to a three day event, taking place on 3rd, 4th and 5th August, with more attractions, more vehicles, more flying and more big bangs. This year we are delighted to welcome back the fantastic WW2 vintage B-17 Flying Fortress Bomber ‘Sally B’, the last remaining airworthy B-17 in Europe! It quickly took on mythic proportions, and widely circulated stories and photos of B-17s surviving battle damage increased its iconic status. The B17 could fly higher than any of its Allied contemporaries and established its place in history, dropping more bombs than any other U.S. aircraft in World War II. 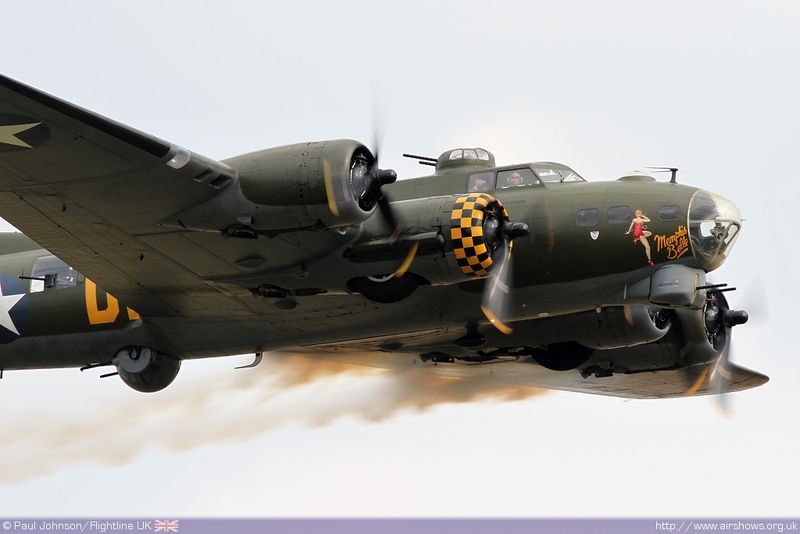 The Sally B has featured in many feature films, most notably the blockbuster film “Memphis Belle”. It will again amaze the crowds with low level displays as this truly historic aircraft is put through its paces. “Sally B” has always in the past performed the most amazing air display at Damyns Hall, especially as the aerodrome is fairly small, when this almighty warbird fly’s past it feels like you can reach out and touch it, it is a display that cannot be missed! If Warbirds are of interest to you, then you will be in for a big treat at this year’s show with a superb display from the magnificent Spitfire the iconic shape and unmistakeable noise stir the imagination and the emotion of all that watch. We also welcome the Hurricane “Hurribomber” a first for our show. The WW2 fighter trainers – the Harvard T6 single-engine advanced trainer aircraft used to train pilots of the United States Army Air Forces, United States Navy, Royal Air Force and other air forces of the British Commonwealth during World War II and into the 1950s and the Boeing Stearman, the work horses of the training airfield which were used to train many Battle of Britain heroes – will also join the line up to entertain the crowds. The incomparable Jungmeister will also be displaying demonstrating its flying versatility. A rare Messerschmitt 108, another classic WW2 aircraft from the German Luftwaffe. The ME108 will also form part of a Living History static display on the ground. Many of the aircrafts will be landing as well over the weekend, so it is a fabulous rare opportunity to get up close. As well as all this there will be so much more to see whilst your there admiring the sights and sounds in the skies including helicopter pleasure flights, along with 300+ military vehicles, living history displays, live entertainment all day, arena activities, including big bangs and even bigger vehicles! Kids’ activities, vintage funfair, refreshments, stalls – there truly is something for everyone and at great value for money! We’ve got more exciting news coming very soon – so watch this space for the next BIG ANNOUNCEMENT!! !